I hope everyone took advantage of the calm surf and great conditions we had along our local beaches on Saturday because the forecasted wind and wave heights for the upcoming week are going to be pretty rough. 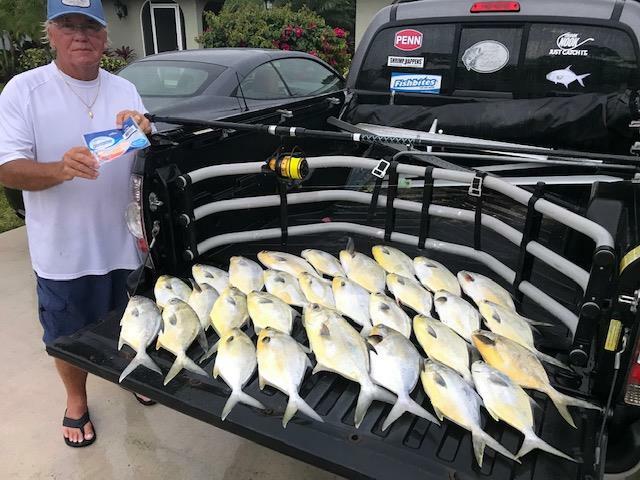 Pompano, whiting, croaker, and bluefish highlighted Saturday's action at various locations and there were plenty of fish caught. I received reports from Tiger Shores and Stuart beach that had pompano, whiting and croaker catches and a great bluefish bite was reported from Santa Lucea. I fished at Bridge Road in Hobe Sound on Saturday and I will tell you, the Springtime Pompano bite seems to be on. As usually occurs in the spring, the dawn to 9 am bite was very good and after a couple of hours lull during midday, the late afternoon activity picked right back up. EZ Flea Fishbites, clam strips tipped with Orange Clam and yellow Fishbites, and frozen sandfleas tipped with EZ Flea and Pink Crab Fishbites, produced non-stop action. Remember, you have to be able to reach the pompano to catch them. There is a reef that is evident along the Bridge Road Beach and being able to put your baits just inside of the reef will produce constant strikes. I am using the Penn Spinfisher Longcast spinning reel on a 12-foot surf rod and using that combination will put you in the zone 70 to 90 yards from the surf line. This is great spring surf action and as long as the persistent weeds that we have been putting up with stay away, the bite will only get better. A quick note for anyone who was not able to get out and catch a tasty pompano dinner, the fantastic New England Seafood Fish Market in Jensen Beach has some very fresh pompano in their display case that will taste as good as they look! !